According to Greek mythology, Zefiro was the tender and kind God of the Western Wind. In 1989, the oboists Alfredo Bernardini and Paolo Grazzi, and the bassoonist Alberto Grazzi, members of the most outstanding baroque orchestras, founded Zefiro, a versatile music group specialising in the eighteenth-century repertoire that gives particular prominence to wind instruments. Since then, Zefiro has performed at many major European festivals, including those of Amsterdam, Aranjuez, Barcelona, Bonn, Geneva, Graz, Helsinki, Innsbruck, London, Liege, Lyons, London, Malmö, Manchester, Milan, Munich, Palma de Mallorca, Paris, Potsdam, Prague, Ravenna, Regensburg, Rome, Salzburg, Stuttgart, Stresa, Utrecht and Vienna. They have also played in Israel, Egypt, Japan, Korea, USA, Canada, Argentina, Chile, Uruguay and Brazil and have always received enthusiastic responses from both audiences and the press. In 1999 Zefiro has realized a documentary-film on Antonio Vivaldi for the Belgian broadcasting company RTBF. Zefiro’s recordings include the six sonatas for two oboes and bassoonby Jan Dismas Zelenka, the complete works for wind ensemble of Wolfgang Amadeus Mozart and their own arrangements for 12 winds and a double bass of excerpts from the three Mozart operas to librettos by Lorenzo da Ponte. They have also recorded concertos for oboe, bassoon and strings and Concerti per vari strumenti by Antonio Vivaldi as part of the project by Opus/Naïve for the complete recording of music by this composer from the University Library of Turin. 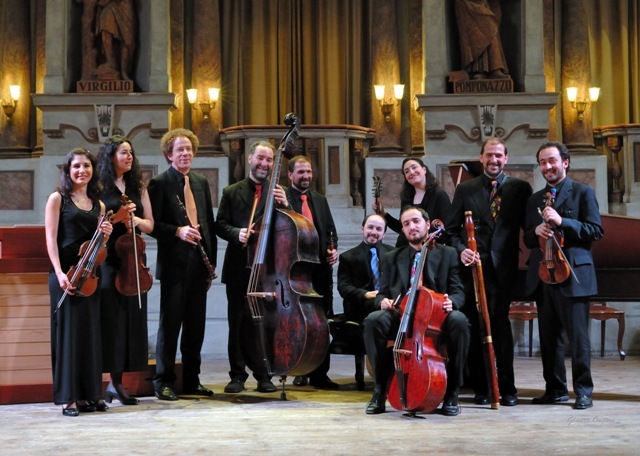 The ensemble has also rehabilitated two remarkable composers of the late eighteenth century, Georg Druschetzky and Luigi Gatti, and its recording of Handel’s Water Music and Telemann’s Wassermusik has established Zefiro’s reputation also as a baroque orchestra. Other recordings include wind music by Beethoven, the Divertimenti for winds and strings by Mozart, The Musick for the Royal Fireworks by Handel, concerti and overtures by Fasch, concerti for oboe and bassoon by Mozart and oboe concerti by brothers Joan, Josep and Manuel Pla, all published on Deutsche Harmonia Mundi/Sony Music. Recent recordings issued on the label Arcana include concerti for bassoon by Vivaldi (2013), overtures by Telemann (2013) and Venetian concerti for oboe by composers like Albinoni, Marcello, Sammartini and Vivaldi (2014). All these CDs have received several international awards, including the coveted Grand Prix du Disque, the Premio Nazionale Classic Voice, the Editor’s Choice by Gramophone, the Choc du Monde de la Musique de l’année 2007 and the Diapason d’Or de l’année 2009; Zefiro now has a worldwide reputation, famous for its virtuoso performances of the wind repertoire on period instruments. Zefiro's activity is divided into three formations: chamber ensemble, wind group (Harmonie) and baroque orchestra to cover a vast part of the baroque repertoire from Vivaldi concertos to Handel operas, from Bach cantatas and Haydn masses to wind music by Mozart, Rossini and Beethoven.